Missed this one. 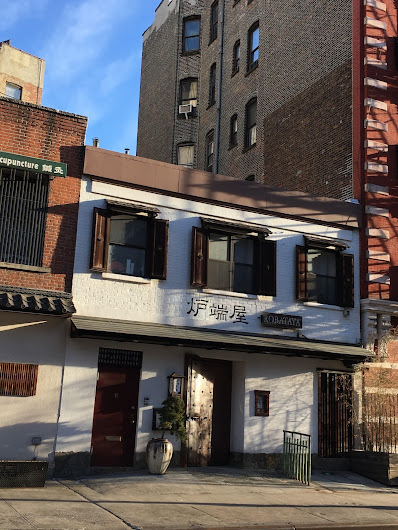 EVG reader jba shared the news that Robataya closed on Ninth Street between Second Avenue and Third Avenue. Robataya will be going out of business on December 30, 2017. We would like to take this opportunity to thank you for your patronage. The Japanese restaurant, which opened in 2009, was part of Bon Yagi's (Soba-ya, Curry-Ya, Rai Rai Ken) empire. I think Mr. Yagi sold this place to some restaurant group not long after it opened. I remember because that's when I stopped going. I remember when this was the wonderful Italian restaurant, Col legno, where I enjoyed a great many wonderful meals! IIRC, that closed b/c the owner of the Japanese restaurant had bought the building and wanted them out so that Robataya could open. I still miss Col legno, with its wonderful wood-fired pizza oven, which gave literal & figurative ambiance to the room. And of course I miss the pizzas & the wonderful menu of other Italian dishes as well! The owner & his great staff knew how to run a restaurant! It was sold to OOTOYA. The decor of this restaurant is beautiful. I wonder if this building's gonna get demolished? Maybe it's just me, but Robotaya had one of the most unwelcoming facades ever. It was like a challenge: "We dare you to come inside and find out what's in here!" And not once did I ever go inside; it reminded me more of a "social club" than a restaurant serving the general public. Not every restaurant requires glass fronts and 1,000 watt bulbs. I believe they are re-opening during the Spring season after renovation and it's going to be under Yogi's managment again. I hope so. That was one of the most fun restaurants, with some great items like the warm sea urchin which brought texture and flavor to an item it took me years to appreciate. I was devastated when I saw it closed this week. But we can’t blame the facade. Some of the best Japanese places are hidden underground or in office buildings, similar to how great establishments in Tokyo are hidden in subway stations and under bridges.